Abtech BPG and BPGC Enclosures are available in 16 sizes produced in glass reinforced polyester (GRP). The GRP material is highly resistant to contamination from oils, fats, aliphatic and aromatic carbohydrates, bacteria and enzymes. The Abtech BPG Enclosure is also suitable for applications requiring LSOH (low smoke zero halogen) material. This material provides excellent mechanical strength and life expectancy and offers a good alternative to aluminium or cast iron. The enclosure material is thick enough to allow tapped entry holes to be machined in the walls. Abtech BPG and BPGC Enclosures are moulded from SMC material rather than DMC which is the most common form of GRP. By using the SMC material in the moulding process, the glass reinforcement takes the form of sheets rather than short strands which means mechanical strength is increased considerably. In addition, should the enclosure be subject to fire conditions the structure will hold together even if the resin is depleted due to the elevated temperatures. When the Abtech BPG and BPGC Enclosures are fitted with ceramic terminals they meet the requirements of IEC 331 (750°C (1382°F) for 3 hours) and also BS6387/1983 (950°C (1742°F) for 3 hours - flame only). Further information about this testing procedure can be provided on request. Abtech BPG and BPGC Enclosures feature a labyrinth seal system, which ensures the seal is protected from external forces. As a result of this seal system the BPG range offers excellent ingress protection qualities rated to IP66/67. In addition the BPG Enclosure has passed the Shell/ERA deluge test which was designed to properly test enclosures and electrical equipment which is routinely subjected to conditions on ship decks or from fire deluge systems. The mounting holes of the BPG Enclosure are contained within the profile of the enclosure but sit outside the seal and grade 316 stainless steel is used for all external fasteners and fixings ensure the reliability of this high quality enclosure. The BPG range incorporates a number of features which makes it the versatile solution for a wide range of applications which include industrial and hazardous area junction box use, OEM applications, fire protection systems, tunnel wiring etc. BPG enclosures can be machined, drilled, tapped with various thread forms, painted. In addition the BPG enclosure and can be moulded in a variety of colours offering improved durability of colour when compared to alternative painted options. 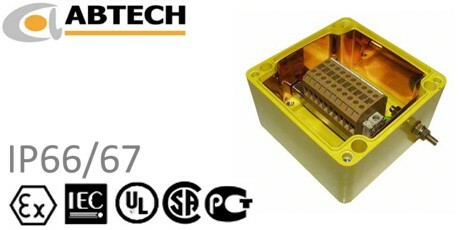 Abtech BPG enclosures are also available carbon loaded (please see BPGC enclosures). This helps to reduce the surface resistance of the material and consequently reduce the risk of spark from static build up. The BPG enclosure range offers various means of Earthing. An internal / external earth stud which can be connected to the terminal mounting rail or component mounting plate, an earth continuity plate (ECP) may be fitted around the inner walls to provide continuity for cable glands and various rail mounted earth terminals or proprietary earth bars can be fitted inside the BPG enclosure. When fitted with a standard neoprene gasket, the enclosure is suitable for ambient temperatures of - 40°C to + 80°C (-40°F to +176°F). Alternatively, when fitted with an optional silicone gasket the temperature range is increased to - 70°C to + 130°C (-94°F to +266°F). For certified apparatus please contact us for ambient operating temperatures. The BPG and BPGC enclosures are suitable for use in hazardous areas and can be supplied with a number of certificates, specifically ATEX EEx'e' to BS EN 50019 (zone 1 & 2) EEx'nA' to BS EN50021 (zone 2) and NEMA 4X (CSA, UL & FM class 1, div 2). Abtech BPG enclosures can be supplied fitted with any component approved terminal to apparatus level or can be supplied empty as component approved for the clients own certification requirements.